I love Halloween. Actually, I love every holiday but there’s just something about Halloween. Perhaps it’s the time of year? The fact that you get to be someone else for a day? I don’t know. But some of my most fond memories take place right around Halloween. And to this day I’m unable to sit in a public library without conjuring up thousands of memories surrounding Halloween. I first discovered this recipe 4 years ago while I was trying to find a sugar cookie base for my annual Christmas Story Leg Lamps. (Remember this?) The problem I was having was that most every recipe left me with too weak of a cookie and these cookies were to be mailed to many different people. The good news is, the leg lamp (in the original story) breaks and the father is devastated, so I just went with it. I sent everyone one large leg lamp cookie surrounded by a bunch of smaller (and therefore more stable) cookies as stuffing material. So, while trying several different types of sugar cookies (and I tried a LOT of recipes) this recipe was my favorite. It was the sturdiest and the easiest to manage. Since then, I’ve been using this recipe for every holiday. You simply can’t go wrong with it. 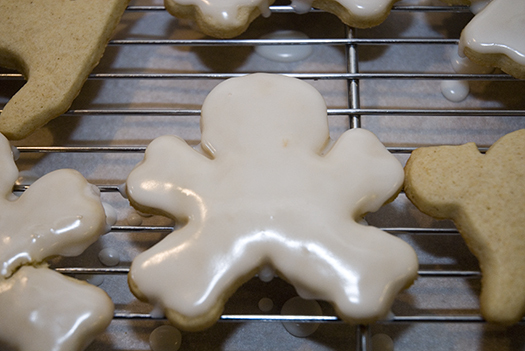 If you’re a lover of holiday, cut-out cookies, I highly recommend bookmarking this baby. Remove the butter from the refrigerator. 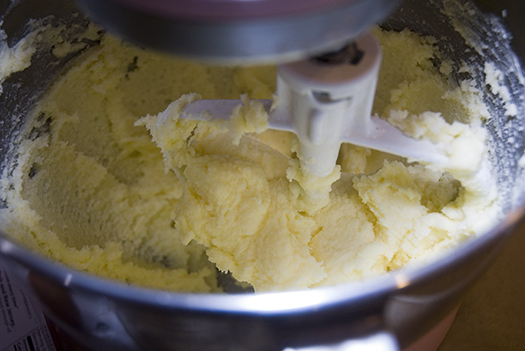 Let it sit in the mixer until it’s room temperature and easy to spread. Add the vanilla and eggs. Stir it up! Add flour, baking powder and salt. Stir that up. 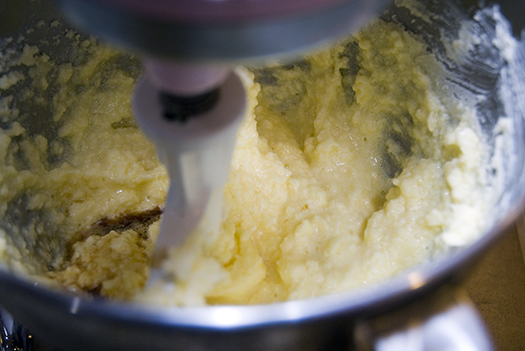 The dough will become a bit unruly for the mixer. I used my hands at that point and formed it into a big ball. Cover it with saran wrap and refrigerator until chilled. If you’re splitting this up, you’re done. Put that in the fridge for the night and clean up! Please note: This does not have to be done the day before, you can do it day of and let it sit for an hour or two, but I like splitting this up due to total time involved. Remove the dough from the fridge. Cut a piece off the large ball and put that on a piece of parchment paper. Let it sit for a minute or two until it becomes a bit more manageable. 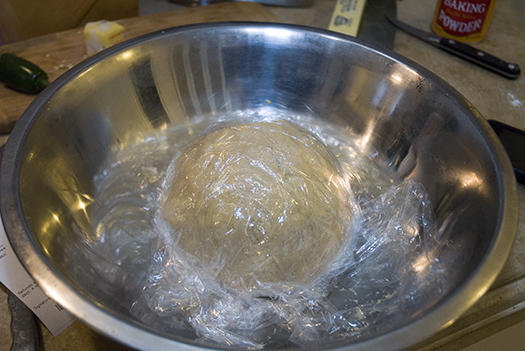 Begin to roll out the dough until it’s 1/4 to 1/2 inch thick. 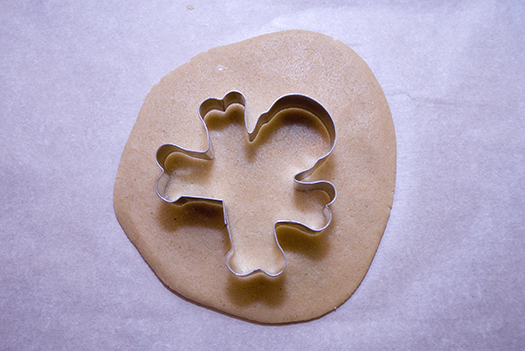 Cut out your cookies until you have very few non-useable scraps left. 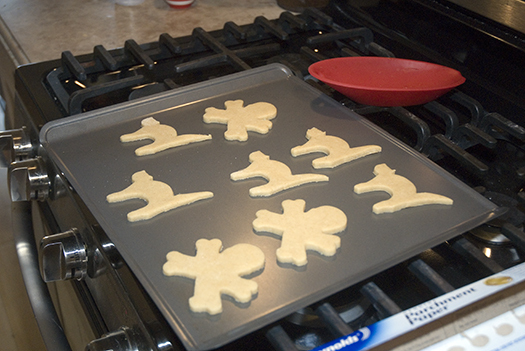 Place cookies on a cookie sheet at least half an inch apart. Let them cool until you can safely remove them without breaking them. Place them on a wire rack to cool entirely. I mentioned before that I don’t use measurements while making my icing. I just eyeball it. 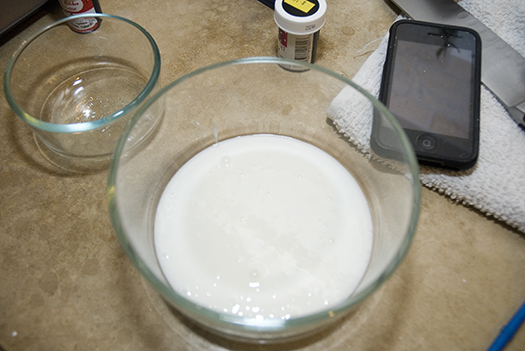 If I have too much powdered sugar, I add more milk and vice-versa. Remember: you need a LOT more powdered sugar than milk. Start small and work your way up. Trust me when I say that a little milk goes a long when when dealing with powdered sugar. 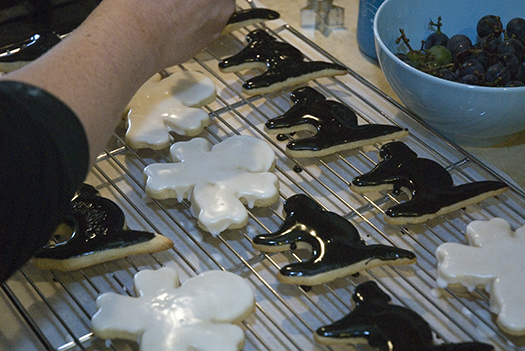 Dip or paint your cookies in white. 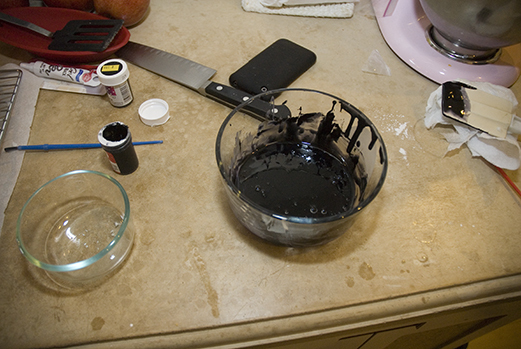 Add black food coloring to some of the white base. Dip or paint that onto your cats (or whatever it is you’re creating). I like to break this recipe up into a three-parter because it works out better for me that way. 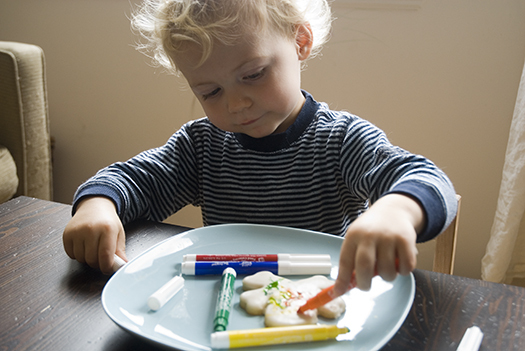 (First: dough; Second: baking; Third: decorating.) Just do what works best for your schedule. Also, you can give the kid something to do too! I have these baking pens. I gave Emory one of the skull and crossbones and let him go to town on it. Use sugar instead of flour while rolling the dough. Not too much! But it does the trick and keeps the dough from sticking. Roll your dough out on a parchment paper. It’s much easier to manage. Some people even bake the cookies on the parchment paper instead of peeling them off and transferring them to the cookie sheet. That also works, especially if you have delicate cookies (like the leg lamps!) These didn’t need that, though. They didn’t have too many areas conducive to tearing. Also! Feel free to freeze the dough. I did that this time so I could make more cookies as we near Halloween. I’ve made theses using orange zest. (For Easter). I have added almond extract to Christmas cookies. I’ve also added lemon zest for anytime cookies. I’ve used half whole wheat pastry flour, (not for any other reason other than I ran out of all-purpose). It worked just fine. As always, let me know if you have comments and/or suggestions! These look awesome! I might have to make them! I usually hate working with powdered sugar to make cookie icing but you make it sound easy. Cutest cookies ever! Can’t wait to try them. I saw the picture of these on TJ’s twitter and thought they were AMAZING. You should open a sweet shop. These are fantastic. these look great. i’m loving the baking pens idea. 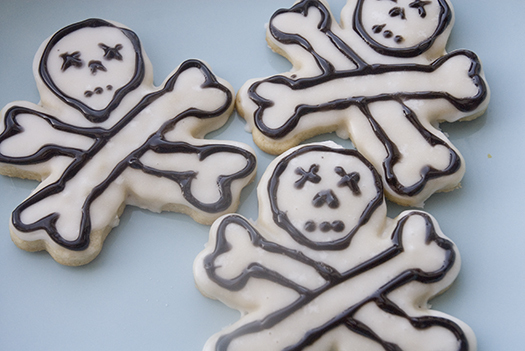 These make me want to add a skull cookie cutter to my already-too-extensive cookie cutter collection. Fantastic! 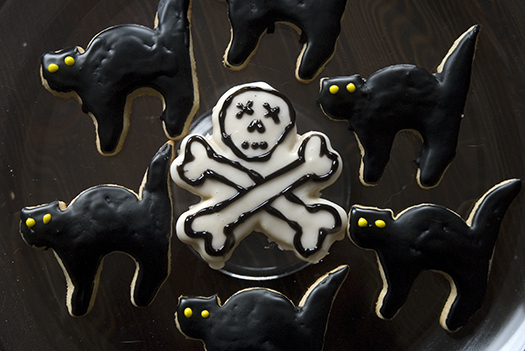 I also love Halloween and every year I make a huge batch of cookies similar to this to give away to friends and family. 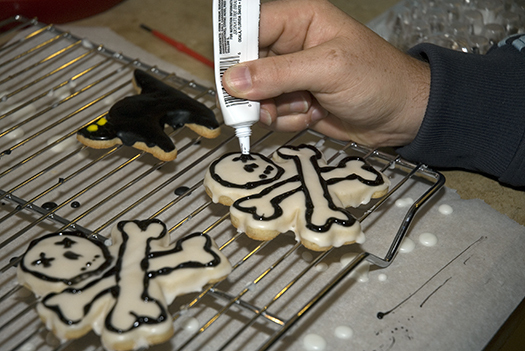 Of course, I do not yet own such a fabulous skull and crossbones cookie cutter, therefore my life is incomplete. Covet! Good suggestion on the almond extract. I always use a little bit to add some oomf to the icing no matter what the season . I love the idea of using zests too! I am always on the lookout for a new sugar cookie recipe too! Are these cookies soft after baking or crunchy? Michelle: They are sort of in between but more on the softer side. Put it this way: they stand up pretty well (even dipping them upside down into the batter). They don’t break. But there is no real snap to them. So… I guess they’re in between? Thanks Michele! Sounds like the pefect balance of softness, I will have to give the recipe a try. how neat! I really want some cookies right now, thanks MiHow. But I’d want to decorate them more than actually make them. As my dozens of burned and shameful baking adventures will protest, baking isn’t exactly my forte. Yummy and cute. Chiara and I enjoyed our cat cookie thoroughly. You rule the baking world! I have no patience for baking! I had to delurk and say those are hella cute. I’m not even real into the whole skull n crossbones thing, and those still had me at hello.